This inexpensive yet state of the art necklace is just another example of how Turkish silversmithing excels in creating more volume with less silver mass. You can even try it yourself: all parts are available separately under the category Turkish Silver Supplies. 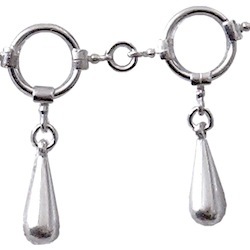 Sterling silver rings carry drop shaped hollow and closed charms. 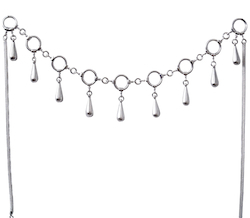 A pair of fox-tail chains complete the ringed part from left and right, to be joined at the neck by a tiny spring ring clasp..